SEADOG is located in Saldanha Bay, approximately 120km from Cape Town, on the West Coast of South Africa. The Port of Saldanha is the deepest and largest natural port in the Southern Hemisphere. It is ideally located to hold a dominant position in the growth of the oil and gas industry. The closest airport is Cape Town International. At SEADOG, we are committed to providing quality, progressive education using on-line learning and on-site skills development. We support student-centered learning to ensure that individuals trained at SEADOG demonstrate competency through a combination of knowledge, understanding and skills that produce optimal performance and safe working practices. SEADOG's competence management system provides evidence, that is cross referenced to industry guidance,that learners have the required knowledge, skills, understanding and behaviour to perform their role. C-DOC Partnership: The C-DOC health care professional team offers on-site occupational health support and training specific to the diving industry. C-DOC offers expertise to the learners in respect of approaches to safety, first aid and oxygen administration training and diving medical emergency response planning. D+MER Partnership: D+MER is an online blended learning Competence Management System specific to all those involved in diving operations. The quiet waters within the bay are ideal before the trainees are exposed to the rigors of diving in the open ocean on one of SEADOG's dedicated diving vessels. Safety Induction: On arrival all students are provided with personal protective equipment and trained accordingly. This is supported by an on-line learning module regarding Approaches to Safety. SEADOG is committed to occupational health and safety and safeguarding the environment. We work with our learners to provide a safe workplace. 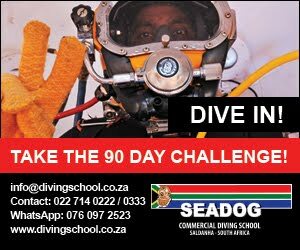 Watermanship Training: Diving is a safety critical and physical demanding task and for those reasons the learners require adequate reserves of physical fitness. Fitness is considered go be protective against decompression illness and other health risks. Seamanship Training: All learners complete pre-sea qualifications. SEADOG ensures personal safety at sea, good deck work, basic rigging and good seamanship when aboard one of the 5 dedicated diving vessels. Working at Heights: SEADOG promotes the safety awareness when working at height. Skills training is to equip learners with the knowledge, skill and attitudes to work at height safely. Realistic Training: SEADOG's unique location on 700m's of waterfront with a private training jetty, provides the trainee with realistic conditions and exposure to seamanship and diver training. Transport: Seadog provides a professional transport Service to assist you effortlessly between Cape Town International and SEADOG diving school. Catering: International cuisine and extreme hospitality! No cleaning no cooking - All students are given a good breakfast, packed lunches for seagoing days and a hearty evening meal. International cuisine and extreme hospitality!. *SEADOG is an authorised Kirby Morgan Training facility. The only school in SA authorised to train Kirby Morgan user operator and technician courses. SA ROV : SA ROV Training facility. Trainee Air Diver Technician: on request. *Training is provided by C-DOC registered Health Care Professionals with experience in the emergency care and diving medicine.